The new RapidRide F Line will begin service next September between Renton and Burien, replacing Route 140. To serve more riders and to make the transit system more efficient, Metro may change other bus routes in Renton at the same time. Metro is considering possible changes to routes 105, 110, 155, 908, and 909 to improve efficiency of the transit system in Renton. 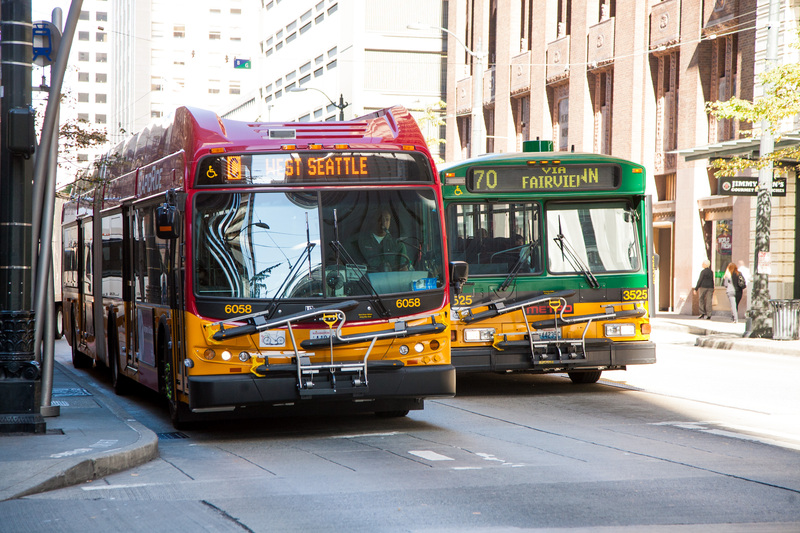 Reorganizing some routes allows us to reduce duplication and invest resources in areas with higher ridership demand and high potential for growth – and make better use of taxpayer resources. Information about this project and an online survey are available in Spanish on the project website. You can also find additional events we have scheduled for this project on the Have a Say calendar. We’re accepting public input on this round of concepts through Friday, Dec. 7. Then we’ll come back in late January or early February to get your opinion one more time before we make a recommendation to the King County Council. Adopted changes will be made in September 2013. Pretty much what they say above only regarding the 110. Most people that ride the 110 bus with me 5 days a week, say that if the 110 is dicontinued, they will drive. That means loss of ridership for BOTH King County Metro and Sound Transit. The 110 has worked well for years, why try to bury it in the mess you are trying to make? I already have a 3 hour and 45 minute commute. That’s on the good days when everything works well. NOW, you would like me to either get off the train, board a bus, get off that bus and board yet another bus after waiting, (gee, how long?) in order to get to work; OR take the rapid ride all the way and add another 15 minute walk twice a day in order to get to work and then home. I am already gone from home 12 hours a day and you want to make 12.5 to 13 hours? That’s ridiculous. Has ANYONE that is involved making these decisions ever commuted by bus and train to get to work? I highly doubt it, because if they did, they would know that your proposed changes will add time to EVERYONE’s commute. At least all the people I know. If you delete the 110 bus route, be prepared for less ridership. You can explain that to Sounder people as well. Hi Carlos – Route 140 will become the RapidRide F Line. It will follow the same routing as it does now, be extended to north to serve The Landing, and operate more frequently if the changes being considered are enacted by King County Council. Route 102 will continue to serve Fairwood residents during peak commute times and Route 155 will also continue to provide service to Fairwood residents. Why route 140 needs to become a rapid ride?! There are chronic transit issues in Renton, but route 140 is not one of them. The resources for pretty 140 rapid ride are much more needed to fix overcrowded commuting corridors and elimination of transfers in Downtown Renton. Most residents on Benson and Talbot Hills commute for work to Seattle and Bellevue(not Kent or Burien!) but there is still no direct frequent service to anywhere north of Renton Transit Center. Enhancing route 161 would benefit residents and employees way more than increasing frequency on 140. Valley Medical also remains undeserved by transit. People living in this hospital district in Newcastle and Renton Highlands can’t even get to it by transit. 240 and 105 still terminate in Downtown Renton. Getting to the airport is also a mess, even tough it’s on the same street that 155 travels on. If 155 could only continue on S180th-S176th west of Southcenter for another 20 blocks, it will be worth ditching your car, because it will save so much money on Airport parking. Unfortunately none of the proposals offered by metro offer any improvement to Renton’s dysfunctional bus system that’s currently only brings more traffic congestion than relief. Everyone ends up driving to Downtown Renton to avoid transfers… with all these issues, somehow 140 gets picked for a rapid ride?! You can’t be serious. This is like another SLU Street Car.